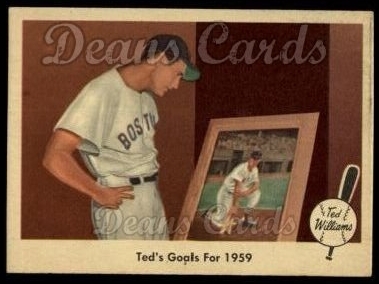 One of the most memorable Boston Red Sox players of all time, Ted Williams, was immortalized in the 1959 Fleer baseball card set. The set consists of 80 cards total. Each card commemorates an event or period of time in Williams' life. 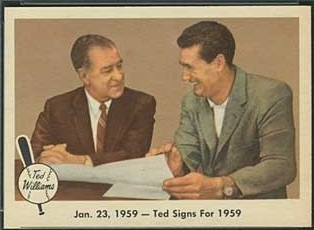 After a 17-career that was interrupted twice by military service, Ted Williams was planning on retiring after the 1960 season, so the Fleer Gum Company issued its very first card set after signing a contract with Williams. Topps had signed most of the other players to their contracts at the time, so it was lucky for Fleer that Williams was willing to allow them to print his cards. The set itself has only a few cards that are difficult to find. The #1 card, which shows a young Williams with his friends, presumably in his childhood home of San Diego, can be hard to find in nice condition. 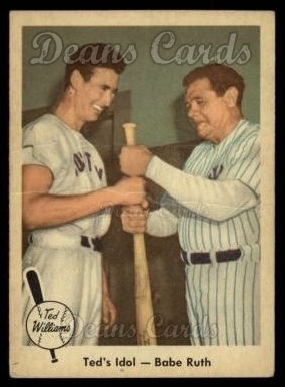 Card #2 shows Williams meeting Babe Ruth. Although their playing careers never overlapped, Ruth was supportive of Williams and even declared him to the 1939 Rookie of the Year even though that award did not exist at the time. The #68 card is unusual because of the circumstances that make it rare. Williams is shown signing a contract with Red Sox GM Bucky Harris, who was under contract with Topps for 1959. This forced Fleer to pull the card mid-production and, therefore, very few exist. The final #80 card is also somewhat hard to find. It shows Williams looking at a painting of himself. This is the first time we've ever had so many Near Mint and Near Mint/Mint 1959 Fleer cards in stock. To see our entire inventory of 1959 Fleer cards, please click here.